As a Young Adult Librarian, I love this mission statement. It’s got “free and easy” in there, which I think all of us can agree is a good thing. It says that our library is not just a book warehouse, but that we offer technology and support to percolate ideas (hey we have DVDs and music, too). And then we get to the last, most important, part: we collect and make available materials for EVERYONE. Once in a while, even in a great metropolitan city like Los Angeles, a patron approaches one of our reference desks holding a book/DVD/Compact Disk/Graphic Novel as if it were Exhibit A in a trial. They protest that the item is offensive or inappropriate or trash (or all three) and insist that it be taken off the shelves. We respond by sharing our mission statement, which sometimes works. If not, the patron fills out a form challenging the particular item’s inclusion in the library collection, and we send the form up the chain of command. In turn, someone in library management composes a thoughtful response that highlights our mission statement, usually points out the item’s artistic and cultural value and/or general popularity and respectfully declines to yank the item from the shelves. Many of you reading this are nodding in assent and thinking, “But of course. This is America. We value free expression and all that.” But every year across the country—in our cities, small towns and schools—library materials are, in fact, successfully challenged and pulled from the shelves (or banished to hard-to-find areas in the library). Typically, the authors of these offending materials are high-profile suspects (troublemakers going by the names of Rowling, Vonnegut, Blume and Walker, to name but a few), but also a legion of unsung heroes who write about issues of sexuality and sexual identity. It’s funny that we never hear about people storming into a bookstore and demanding that the owners pull books from their shelves. As members of a consumer society we seem to innately appreciate that bookstore owners only stock their shelves with materials that sell and we have no right, or little recourse, to tell these owners that they can’t make money off titles that we find distasteful. The bottom line is bookstores will offer Rowling, Vonnegut, Blume, Walker and others as long as people buy them, and they usually won’t offer them if they don’t. 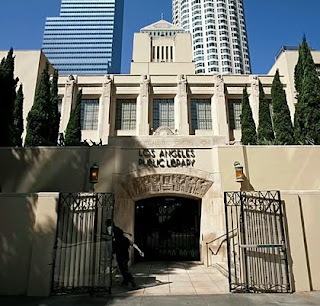 Which brings me to my main point: the difference between libraries and bookstores and why it’s crucial to do everything we can do preserve the Los Angeles Public Library (and other libraries across the country) in what is now our darkest hour. As a Young Adult Librarian, I am charged with building and maintaining a collection of print and audiovisual materials to meet the needs of diverse patrons from grades 6-12. At my high point, my branch manager (at the time) awarded me $12,000/yr to accomplish this, but my current budget (due to harsh economic times) has been reduced to $8,000/yr. Be that as it may, I keep firm sight of our mission statement, and I stock the shelves with books to enrich, educate and empower all the teens from all walks of life who have access to our library. So I’ve got books for jocks, skateboarders, cheerleaders, actors and actresses, awkward kids, misunderstood kids, abused kids, computer geeks, rappers, rockers, black kids, white kids, Asian kids, Hispanic kids, Jewish kids, Catholic kids, Muslim kids and, yes, LGBT kids, to name but a few. Just like a bookstore, I routinely do inventory, except that librarians call the exercise “weeding.” We’re supposed to go through the collection, scan the barcodes and check each item’s “CIRC” (circulation), which is the amount of times the thing has actually been checked out with a library card and brought home. In my branch, a smash-hit like Stephenie Meyer’s Twilight, will CIRC 25-45 times per year. A respectable CIRC for everyone else is 8-12. A real dud is 0-4, and these books are usually weeded from the shelves. However, a seasoned librarian knows that CIRC is deceiving. Why is it that certain books are dog-eared and falling apart, yet have a 0-4 CIRC? Hmmm…many of these titles have LGBT themes. So I should do the proper thing and weed these titles out because they have lousy CIRC, right? If I’m a bookstore owner, I’m yanking them because the bottom line is sales. No sales, no bookstore. But that’s the great thing. The library isn’t a business—it’s a service. I know these books are being read. I know that kids are discretely devouring them in the library because they probably are too embarrassed to check them out or risk being questioned by their parents at home. I know that LGBT teens are probably in the midst of the most vulnerable period in their lives, and they need resources and support to help them navigate their way through an already inherently challenging adolescence. I also know that if these young adults can’t find these books in their local library, they probably are not going to find them anywhere else. So, these “certain” books remain on my shelves—CIRC or no CIRC. And when they finally fall apart (read to death, I like to say) I replace them with new copies and then I replace them again. So if anyone reading this on Lee’s site is glad I’m doing this, then please take action and help me and others fight Mayor Antonio Villaraigosa’s proposed budget cuts to the Los Angeles Public Library—cuts that will so devastate our great library that we will be rendered virtually inoperable. Please go to www.savethelibrary.org to learn more and find ways to help. Join our Facebook page. Sign up for our Twitter feed. Print our petitions and get them signed. Most importantly, call, write and email your local city councilman or councilwoman and tell them how important libraries are to our young people (And tell them I sent you). It really is part of a librarian's job to keep our message out there, keep reminding and reminding the public why what we do is so vital and important. Thanks for reminding me why I got into this job in the first place. Thanks for this post, Henry and Lee! I'm in library school right now and taking collection development. This addresses an important issue in the weeding process. Thanks again! Awesome post! Beautifully done. My mother was a librarian (retired now) my father an educator. I was raised on books and libraries. Posts like this are SOOO important because most people don't realize all the thought and work that goes in and all the benefits that can be reaped. Great post, Lee. Thanks! I just was on a panel at the Florida Library Association conference (and from that was asked to be the keynote at my county library conference) so libraries have been on my mind a lot! As a YA author, I appreciate the courage of librarians all over the country as they fight the good fight to keep the kinds of books on shelves that teens want--and need. As a reader, I love walking into the library to find books that I want--and need--to read. I've signed the petition and urge others to the same. Great post!